You are looking at an unusual silver medal for Bravery not Saint George instituted on August 3, 1878. This medal was awarded to enlisted men and non-commisioned officers and to civilians from the Caucasian and Central Asian Districts for acts of bravery in wartime. The Medal was unusual in that they could also be awarded to females for heroic deeds. 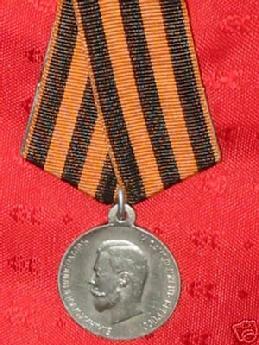 From 1910 on, this medal for Bravery could be awarded to policemen and other civilians no matter where they came from for acts of bravery in suppressing armed disturbances of the peace, capturing bandits, etc. 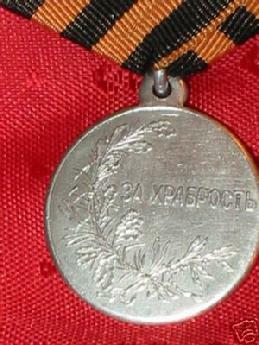 This medal has the russian inscription for bravery with Palm and Oak branches tied by a ribbon and no number.